» Web Log Storming Home » Articles » How to Easily Exclude Unnecessary Hits? In response to our earlier article "How to improve performance", starting with version 2.2 there's another option that will make this process much easier. 1. Load your log files into Web Log Storming as usual. 2. In the Overview report check Total hits value. 4. Identify files that don't affect your stats. You will probably want to exclude style sheets, menu images, logo, scripts, etc. 7. 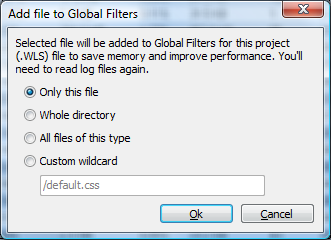 Save project, open File | Properties window and check Global Filters tab. 8. Click Analyze button to read log files again. 9. After reading is finished, see how Total hits value compares to the original. You should notice a great difference which means that you successfully saved large amount of memory without losing important information.